Caracas (AFP) - Opposition leader Juan Guaido, recognized by some 50 countries as Venezuela's interim president, warned the military Sunday that blocking humanitarian aid from entering the country is a "crime against humanity." 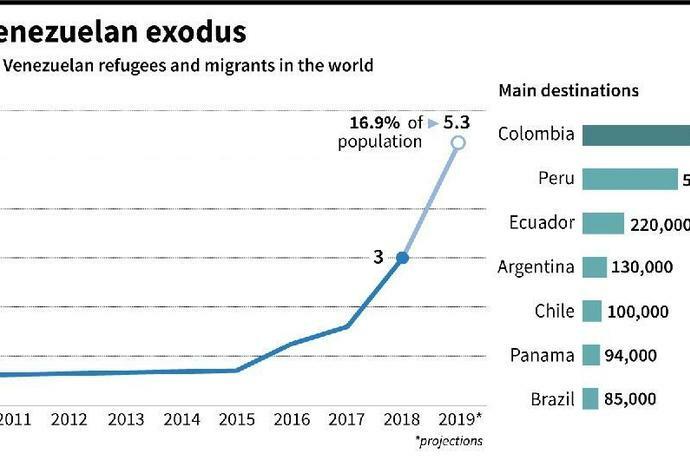 The warning comes as international aid has taken center stage in a test of wills between Guaido and President Nicolas Maduro in which Venezuela's armed forces are seen as the pivotal player. On the Venezuelan side of the border, dozens of doctors protested Sunday demanding the aid be allowed in -- including surgeon Jose Luis Mateus de la Riva, who accused Maduro of sinking Venezuelan medicine back to the "medieval era." 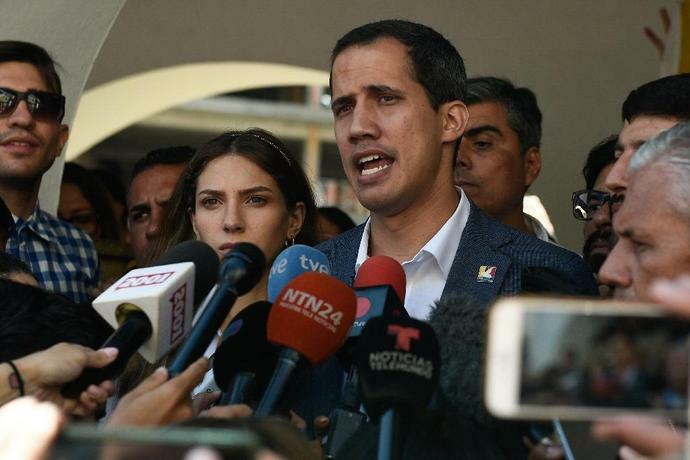 "There are people responsible for this and the regime should know it," Guaido said after attending Sunday mass with his wife and 20-month-old baby. "This a crime against humanity, men of the armed forces." Accusing those blocking aid of being "almost genocidal," he likewise warned that the military would be held responsible for the deaths of protesters -- and reaffirmed his call for a mass march on Tuesday in memory of the estimated 40 people killed in disturbances since January 21. Guaido has offered amnesty for any members of the armed forces who disavows Maduro -- but the military leadership still publicly backs the president. On Sunday, the Venezuelan military announced it had started conducting exercises, set to run until February 15 across the country, to "reinforce the country's defensive capacity." Maduro has rejected humanitarian aid as a US ploy to intervene in Venezuela, calling the deployment of aid a "political show" and blaming US sanctions for the country's widespread shortages of food and medicine. 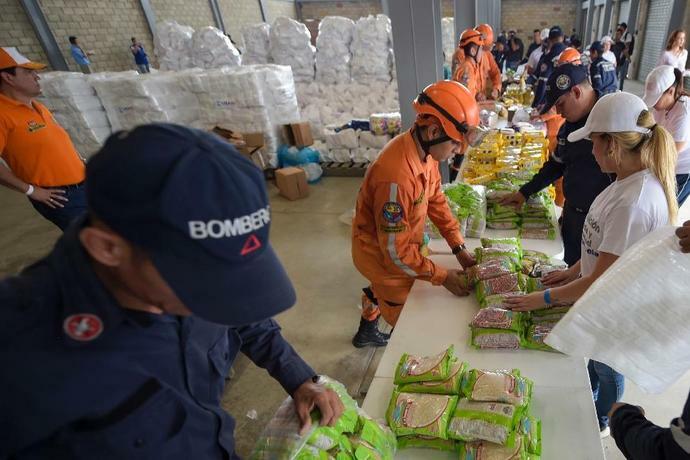 Guaido countered that the regime was refusing to acknowledge a "crisis that they themselves generated," while Venezuelans were working to deal with the humanitarian emergency. Speaking to AFP Friday, Guaido vowed to do "whatever necessary" to "stop the usurpation" of power and "save lives" -- without ruling out the possibility of authorizing foreign intervention. And on Sunday, he said hundreds of volunteers had signed up over the weekend to help bring aid into Venezuela -- with further shipments set to arrive in neighboring Brazil and on a Caribbean island. But Guaido on Sunday reiterated that he would not negotiate with Maduro -- as he believes Maduro would use such talks to buy himself time. "Democracy is closer than ever before, the future is ours," he said. But Maduro, who has asked Pope Francis to act as a mediator, rejected what he said was "bias" by the group. Last week Maduro also rejected a call by European Union countries to hold elections, prompting them to recognize Guaido. Guaido, the 35 year-old head of the opposition-controlled National Assembly, stunned Venezuela in January by declaring himself interim president after the legislature declared Maduro a "usurper" following his May 2018 reelection in a vote disputed by the opposition and international community. President Nicolas Maduro is funneling cashflow from Venezuelan oil sales through Russian state energy giant Rosneft as he seeks to evade U.S. sanctions designed to oust him from power, according to sources and documents reviewed by Reuters. The sales are the latest sign of the growing dependence of Venezuela's cash-strapped government on Russia as the United States tightens a financial noose around Maduro, who it describes as a dictator. With its economy reeling from years of recession and a sharp decline in oil production, Venezuela was already struggling to finance imports and government spending before Washington imposed tough restrictions on state oil company PDVSA in January. U.S. national security adviser John Bolton announced a series of new sanctions against Cuba and Venezuela on Wednesday as the Trump administration sought to boost pressure on Venezuelan leader Nicolas Maduro and the countries that support him. Bolton, in a speech to an association of veterans of the failed 1961 Bay of Pigs invasion, said the United States was adding five names linked to Cuba's military and intelligence services to its sanctions blacklist, including the military-owned airline Aerogaviota. Along with former Vice President Joe Biden, who has yet to declare whether he is running, Sanders is a favorite among Democratic primary voters, according to polls.